The Tactical Helicopter Group (THG) consists of 3 Squadrons, each operating a different type of helicopter. In use are the Alouette 3, AS352U2 Cougar, the CH47D Chinook and the AH-64D Apache. Each type requires its own flight gear. This article does not include the AH-64 gear, as this is to be described in a different article. For the last decade three types of vests were used on the helicopters, the first being the Autoflug GmbH type that looks like the SRU-21P. With a LPU-10 as life preserver. The Autoflug was replaced with the UK made Beaufort Mk.3NL. This type of vest has an integrated life preserver (removable). 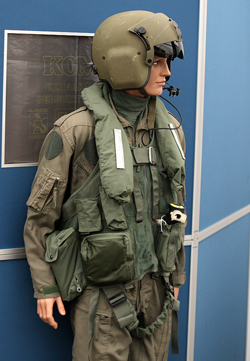 It also features straps that are used to pull the pilot out of the water or the wreckage of his helicopter. Both the vest types contain the usual survival items such as a radio, knife, revolver, strobe light, flares and more. The newer versions of this vest has leather patches sewn to the pockets for increased protection against damage. (see separate article on this website) At the moment the Helicopter Group is testing the Beaufort Mk.61 vest, that's already in use on the Apache in a desert version. When (sea) water temperatures are below 10 degrees Celsius, an immersion suit is worn. This suit has leg, arm and neck seals to prevent water from entering. On the legs there are pockets to store maps. Gentex SPH-4 "Cobra", this grey helmet has a single visor kit with the lock knob on the left-hand side. It was used on the Bo-105CB and Alouette 3 and is now out of service. The helmet has a black Styrofoam liner with TPL. A boom mike is used. Being a single visor set-up, the change of visor had to be done in the shop. This gave problems with dusk operations, as flying without visor was restricted to 60 knots. While operating in Kosovo, some Cobra helmets were fitted with the SPH-5 dual visor kit. The fact that SPH-5 visor kits are green did not seem to be a problem. The modified single visor housing could also be fitted with the Philips night vision goggles. These helmets have been replaced by the HGU-56/P. SPH-5, This is a dual visor helmet almost similar to the SPH-4 used in the US Army. This helmet can also be equipped with the ANVIS system. Due to the noise produced by the CH47D Chinook, some pilots suffered from hearing problems. The SPH-5 was not able to reduce noise to a level on which normal conversation was possible. The communications device in both the AS352U2 and the CH47D had to be switched on to the highest sound level to be heard. To prevent further problems it was decided to order the HGU-56/P and also replace this helmet. HGU-56/P, This new dual visor helmet is also standard in the US Army. Made of advanced graphite composite materials, this helmet can provide better protection to the pilot. The new ear cups are providing a better noise reduction to protect from hearing loss. This helmet also features a TPL. In the Netherlands Airforce, the loadmasters are using a blast shield in front of the helmet (maxillofacial shield). This makes hanging out of a helicopter much easier. With this shield, windblast does not interfere with the microphone and communications. During normal operations it became clear that the boom of the microphone, as used on this helmet, suffers from breaking. There are plans to replace the boom with the older type. It is also possible to connect the helmet to an air-conditioning unit. All the helmets are now fitted with the CEP kit. On this helmet the AN/AVS-6(V)2 and ANVIS-9 can be used as well. An in dept article on the ANVIS system can also be found on this website. The latest developments include an ANVIS-HUD system that offers the necessary information for the pilot in front of his ANVIS.